The Properties include two Properties located in Georgia, four Properties located in Kansas and 11 Properties located in Texas. In the aggregate, the Properties are comprised of approximately 7,238 storage units and 358 rentable parking spaces. 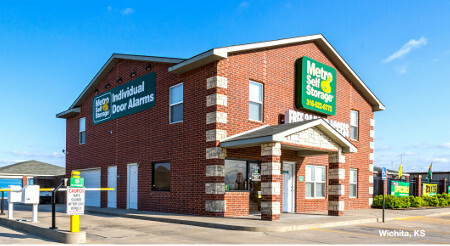 Each of the Properties is operated as a self-storage facility under the Metro Self Storage® name. • Opportunity to Invest in Self-Storage Assets – According to the Self-Storage Association, a not-for-profit trade association representing the self-storage industry, the self-storage industry has been the fastest growing segment of the commercial real estate industry over the last 40 years. The U.S. self-storage industry generated approximately $27.2 billion in annual revenues in 2014. • Diversified Property Locations with Strong Occupancy and Operating History – As of March 24, 2016, the physical occupancy rate for the Properties, based on rentable square footage, was approximately 90.7%. The Properties are located in eight distinct metropolitan statistical areas, or “MSAs,” across three states. With an average of 11.5 years of operations, the Properties benefit from an extended operating history. • Strength and Continuity of Property Management – Each of the Properties is managed by Metro Storage LLC (“Metro Storage”), an established operator of self-storage properties. Metro Storage has positioned itself as one of the nation’s premier self-storage operators and, as of 2015, was the 5th largest private self-storage company in the country and the 12th largest among private and public self-storage companies. As of March 31, 2016, Metro Storage operated over 6.3 million rentable square feet of self-storage space, consisting of over 54,000 self storage units in 98 properties across 12 states. See “Frequently Asked Questions – What is Metro Storage LLC?” Metro Storage has managed the Georgia Properties since the acquisition of these Properties on January 20, 2016, and in that time, has increased the total occupancy by 4.1% and increased monthly rental revenue by 5.6%. Metro Storage has managed the Portfolio Properties since the acquisition of these Properties on April 1, 2016 and Metro Storage also served as the manager of the Portfolio Properties prior to the Trust’s acquisition of these Properties. Over the three year period of 2013 to 2015, Metro Storage has increased annual net rental revenue by 4.5% (on a compounding basis) per year. Accordingly, as of the date of this Memorandum, Metro Storage has familiarity and experience with each of the Properties. The industry has been the fastest growing segment of the commercial real estate industry over the last 40 years and has been considered by certain Wall Street analysts to be “recession resistant” based on its performance since the economic recession of September, 2008. The self-storage industry in the United States generated $27.2 Billion in annual U.S. revenues (2014).